It’s that time of the year again! Graduation/ wedding/ party season. Small plates and finger foods are a must! Make these easy Mexican Sweet Potato Rounds for your next gathering! Those of you that know me, know I have a large family. Eight of us to be exact! There is always something going on, especially around this time of the year. The past few weekends have been spent traveling to a college graduation, confirmation, and finally an eight grade graduation. My favorite part about these spring events are the festivities that follow. Nothing is better than time spent with friends and family, good food, and of course lots of love and laughter. Finger foods are a must at any of these occasions. I was so excited when I heard the Recipe Redux topic for this month was Small Plates for Sunny Days. What a perfect time of the year for this topic! I can’t wait to see all of the delicious finger foods everyone comes up with. 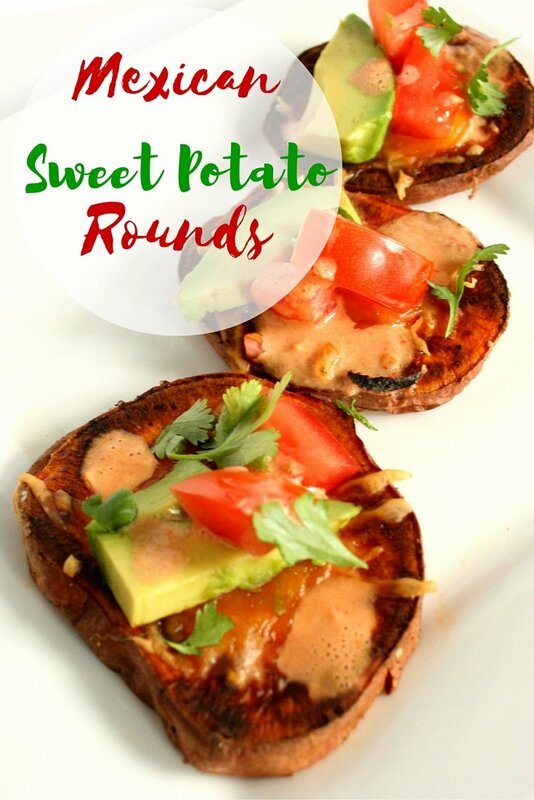 These Mexican Sweet Potato Rounds are the perfect healthy treat for any of your upcoming festivities. They can be eaten hot or cold and are gone in two bites! No utensils needed! 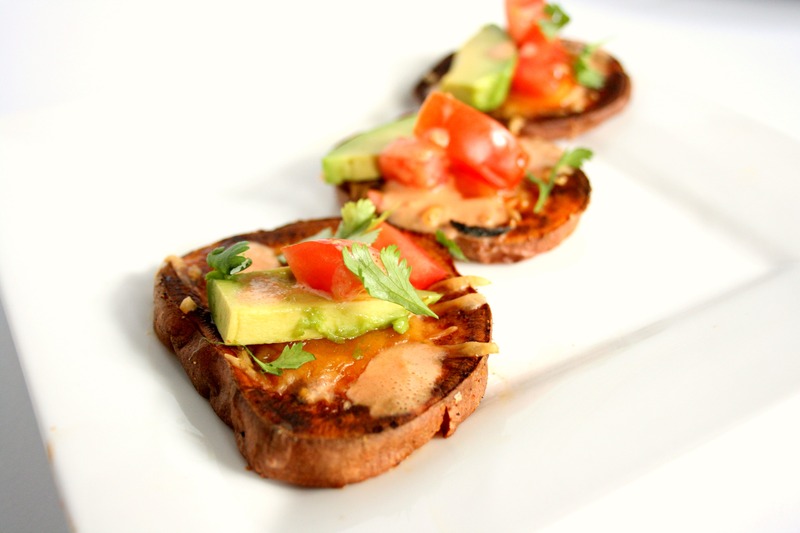 I wanted to make a lightened up version of baked potato skins and came up with these. 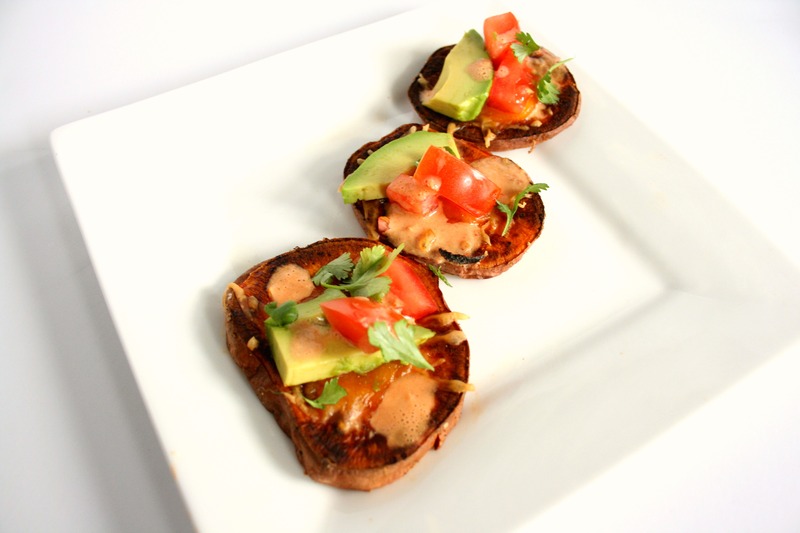 I topped my Mexican Sweet Potato Rounds with cheddar cheese, tomato, avocado, and a chipotle sour cream sauce. However, you could do any toppings you would like. These sweet potato rounds are packed with Vitamin A, fiber, and healthy fats. Your guest won’t even know they’re eating something good for them! It's that time of the year again! Graduation/ wedding/ party season. Small plates and finger foods are a must! Make these easy Mexican Sweet Potato Rounds for your next gathering!